Get caught in the rapture of Created rubies and CZ. Radiant round Created rubies alternate with brilliant-cut CZ with delicate S links in between. With gems consistent all around it symbolizes your eternal love. 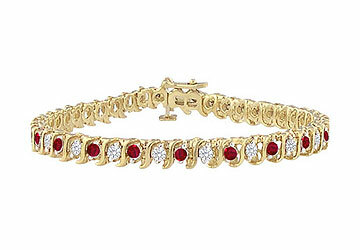 This tennis bracelet is made in sterling silver over yellow gold vermeil and has a total gem weight (TGW) of 3.00 ct.